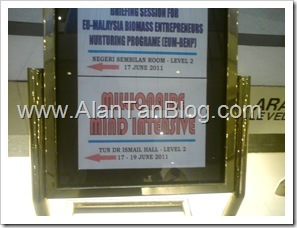 T Harv Eker’s Millionaire Mind Intensive program in Malaysia was A Disaster this morning! Please Avoid this program at all cost! I saw some people were Fighting for a Seat during the event. Many of the participant were sitting in the floor and standing all the way till the door. 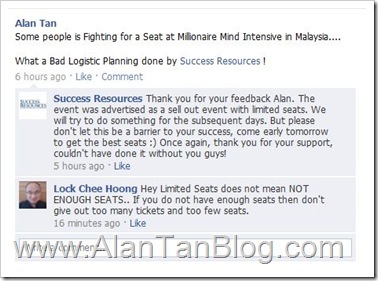 What a Poor Logistic Planning done by Success Resources! There’s are so many people that don’t have seat even with the paid ticket! I don’t understand why must Success Resources sell and promote so many tickets until there’s no seat for everyone. Most of them paid and come from outstation but was turn down due to space constraint. Would Success Resources compensate me for the loss of time, car parking and petrol to attend the event this morning? Their reply doesn’t make sense at all! How to come tomorrow if I’ve missed the first day & already opt for option 1? I never Expect Success Resources to had a bad planning even I confirmed my attendance after getting the ticket via post. What’s the point of confirming my attendance and no seat was available during the event? Success Resources send a SMS reminder to come to the T Harv Eker’s Millionaire Mind Intensive program early but Never send SMS at 9am when all seats have been taken! This entry was posted on Friday, June 17th, 2011 at 10:27 pm	and is filed under Advertisement. You can follow any responses to this entry through the RSS 2.0 feed. Both comments and pings are currently closed. Hope you went for the seminar in December. I did, it just ended yesterday. Yes, there will be a sellout of seats. A lot of people were turned away last Friday too due to a full house. What can I say, you were late. It’s free, what did you expect? Sorry to be harsh but you weren’t serious enough about your financial freedom to bother coming early then complain when others do bother and book a seat. I hope that experience didn’t deter you from coming to the one in December as it was a great event! Maybe you can join the next one in 2012 if you missed this one. P/S – even if you had to sit on the floor, you would probably have learnt something. Did you sign up for any program during the event?